Back when OCZ released the RevoDrive 3 X2 in 2011, it was the fastest SSD for desktop users that we had seen. Using PCI Express, it eliminated the SATA bottleneck that most SSDs still face today while also offering hassle-free RAID, though it wasn't without shortcomings. The RevoDrive 3 X2 was essentially four Vertex 3 SSDs forged together on a single PCB yet it was less than two times faster than a single Vertex 3 in our real-world tests. The same money could buy similar performance with a custom RAID0 setup using separate drives. Now three years later, OCZ is replacing its RevoDrive 3 X2 with the RevoDrive 350, touted as being the ultimate storage solution for intensive workstation applications. 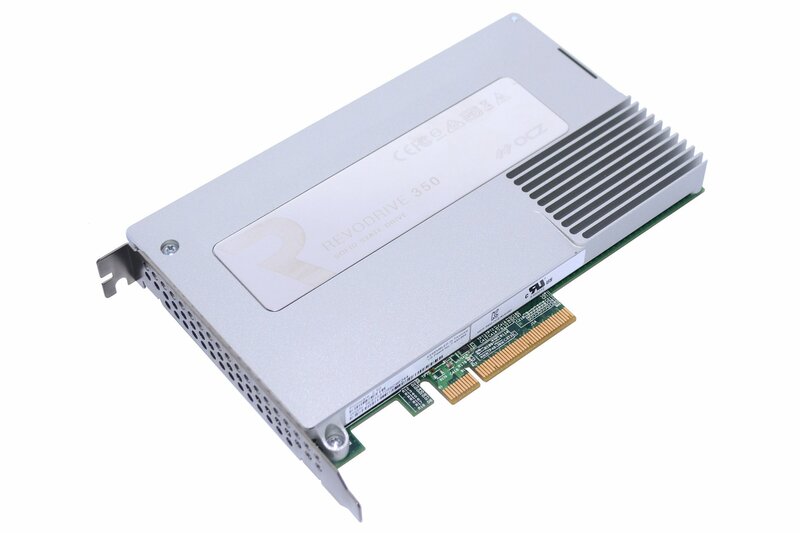 The new RevoDrive has been upgraded to x8 PCIe 2.0 (from x4) and boasts read/write speeds of 1.8/1.7GBps. OCZ tells us the 350 is based on its enterprise-grade OCZ Z-Drive 4500, which can only be good given how that drive performs. Another big change comes down to the use of Toshiba's NAND memory, which is more affordable to OCZ because it is now a subsidiary of Toshiba. 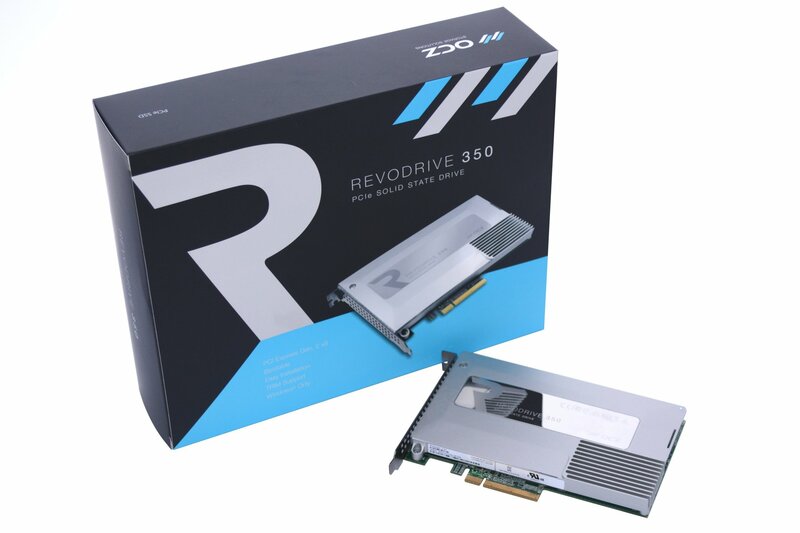 OCZ says that the RevoDrive 350 marks the completion of that transition, so with a bandwidth boost, redesigned drivers and more affordable components from a new parent company, we expect the RevoDrive 350 to overcome some of the RevoDrive 3 X2's failings. 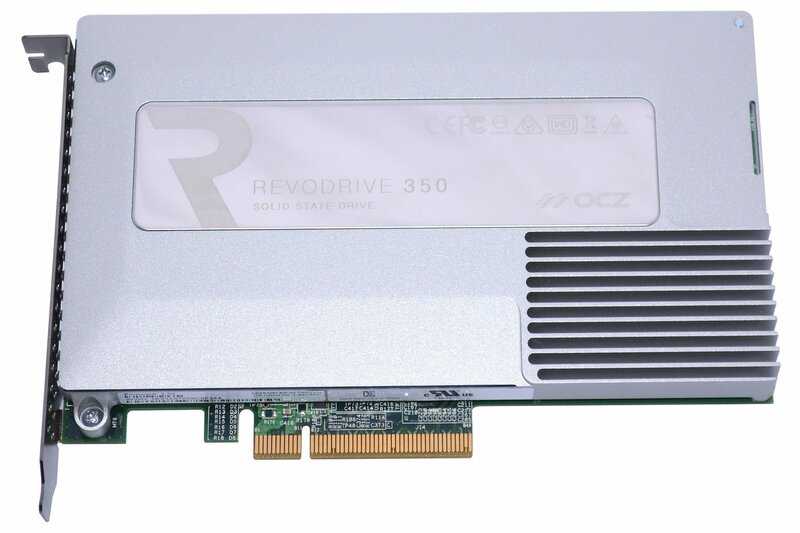 The OCZ RevoDrive 350 is available in three different capacities. We have the 480GB ($830) version, but there are also 240GB ($530) and 960GB ($1300) models. The 480GB and 960GB variants are much cheaper than the RevoDrive 3 X2 which launched at $1,660 and $3,200. While the RevoDrive 350 models are much cheaper than previous versions, the drives are still very expensive. Our 480GB review sample carries a retail tag of $830, 50% more expensive than the Samsung SSD 840 Pro 512GB. Of course, for this price you are getting four LSI SandForce SF-2282 controllers in RAID0. That said, four OCZ Vertex 460 120GB drives would cost just $400, making the RevoDrive 350 480GB more than twice as expensive, which is a little shocking. On the other hand, the RevoDrive 350 offers a much more convenient way to go about RAID0. Four SATA SSD drives require four SATA ports supporting RAID that are connected to a high performance chipset, the RevoDrive 350 simply requires a PCI Express x8/x16 slot. The RevoDrive 350 is an entirely self-contained unit and this has both positive and negative sides. While it doesn't require any power or data cables, you're essentially putting all your eggs in one basket. If one of the controllers or NAND flash memory chips were to fail, the entire drive would become useless. With four separate drives, if one of them fails you need only replace the dead drive -- though, you'd likely still lose all your data if using RAID0. In terms of performance, users are looking at claimed read and write throughputs of 1800MB/s and 1700MB/s for the 480GB/960GB models. The smaller 240GB model claims less impressive numbers of 1000MB/s read and 950MB/s write, which is because the 240GB version only has two LSI SandForce 2282 controllers. 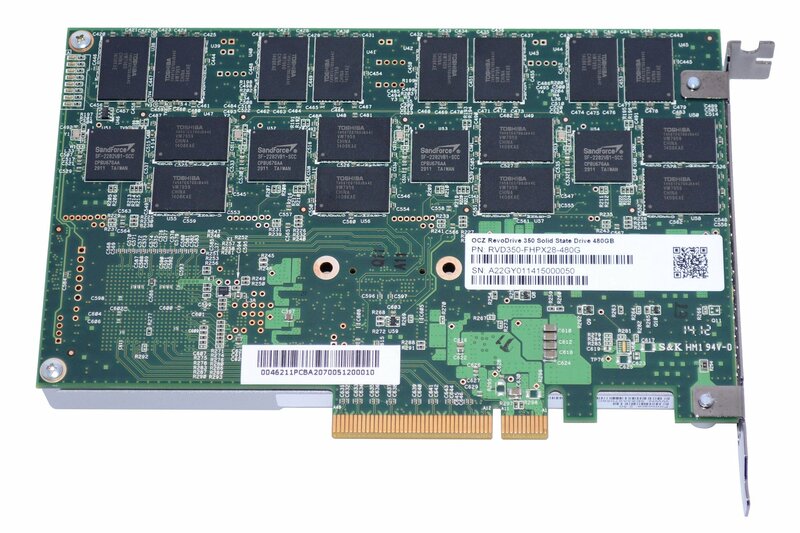 For the 480GB and 960GB models, the four SandForce 2282 controllers are connected internally via the four-port OCZ RAID controller -- little is known about this except that coupled with the controller is a virtualized software layer called VCA (Virtualized Controller Architecture 2.0). In short, VCA enables many features that were present on previous RevoDrives, such as TRIM. Other supported features include SMART monitoring, NCQ, TCQ, power failure management, as well as wear-leveling. The advantage to using PCIe x8 opposed to the SATA interface is that it provides far more bandwidth. The Serial ATA 6Gb/s bus is only capable of connecting devices at transfer speeds of about 600MB/s. 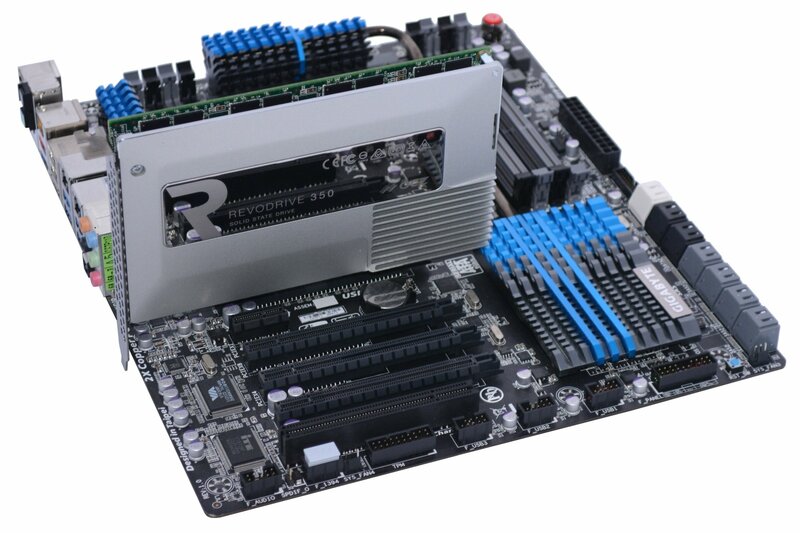 The RevoDrive 350 uses the PCI Express 2.0 8x bus which allows speeds of up to 4GB/s. Another key aspect of the RevoDrive 350 is its ability to be used as a boot drive. Using the supplied drivers, you can let the Windows installation detect and install onto the RevoDrive 350, which we did successfully when testing real-world performance. The RevoDrive 350 measures 167.6mm long x 98.4mm wide x 15.3mm high and weighs roughly 114grams. OCZ claims that the drive is rated for 50GB worth of writes per day for three years and the 480GB model consumes 9.5 watts at idle and 14 watts while active.